And lighten with celestial fire. With the abundance of Thy grace. Who dost Thy seven-fold gifts impart. Where Thou art guide, no ill can come. Is comfort, life and fire of love. And Thee with both to be but One. I will go unto the Altar of God: Even unto the God of my joy and gladness. For Thou art the God of my strength, why hast Thou put me from Thee: And why go I so heavily, while the enemy oppresseth me ? O send out Thy light and Thy truth: That they may lead me: and bring me unto Thy Holy Hill, and to Thy dwelling. And that I may go unto the Altar of God, even unto the God of my joy and gladness: And upon the harp will I give thanks unto Thee, O God, my God. Hail Mary, thou art highly favoured, the Lord is with thee. Blessed art thou among women, and blessed is the fruit of thy womb, Jesus. Ministers: But deliver us from evil. Priest: Confess unto the Lord, for He is gracious. Priest: I confess to God Almighty, Father, Son and Holy Ghost, Blessed Mary, all the Saints, before the whole company of Heaven, and to you, that I have sinned exceedingly in thought, word and deed, through my fault, my own fault, my own most grievous fault. Wherefore I pray Holy Mary, all the Saints of God and you, to pray for me. Ministers: Almighty God have mercy upon you, forgive you your sins, deliver you from every evil; confirm and strengthen you in all goodness and bring you to everlasting life. Ministers: I confess to God Almighty, Father, Son and Holy Ghost, Blessed Mary, all the Saints, before the whole company of Heaven, and to you, that I have sinned exceedingly in thought, word and deed, through my fault, my own fault, my own most grievous fault. Wherefore I pray Holy Mary, all the Saints of God and you, to pray for me. Priest: Almighty God have mercy upon you, forgive you your sins, deliver you from every evil; confirm and strengthen you in all goodness and bring you to everlasting life. The Almighty and merciful Lord grant unto you pardon, absolution + and remission of all your sins time for true repentance and amendment of life and the grace and comfort of the Holy Ghost. Ministers: Who hath made Heaven and earth. Ministers: From this time forth for evermore. 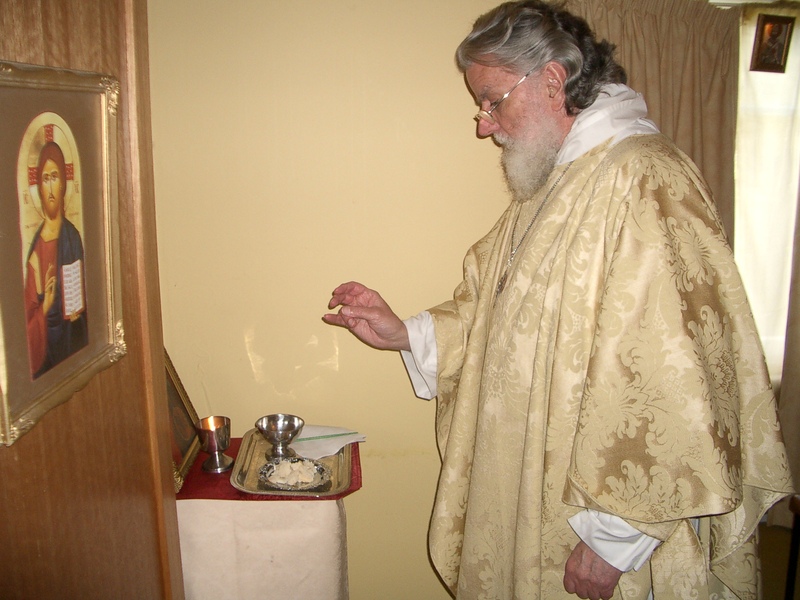 Priest: Receive the kiss of peace and love, that ye may be fit to perform the Divine Liturgy at the most holy Altar. Thou shalt purge me O Lord, with hyssop and I shall be clean, Thou shalt wash me and I shall be whiter than snow. Have mercy upon me O God, after Thy great goodness. R: Thou shalt purge me O Lord, with hyssop, and I shall be clean. V: Glory be to the Father, and to the Son and to the Holy Ghost. R: As it was in the beginning, is now and ever shall be, world without _end. Amen. 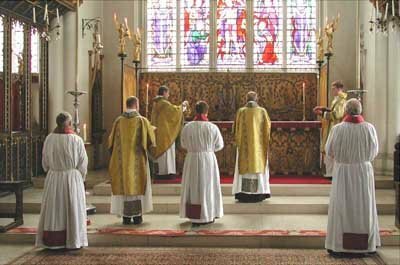 If the Litany is to be sung, the Thurifer, Taperers and Crucifer come to the centre, with the Ministers and all process around the church in the usual way for the singing of the Litany. There shall be a station at the entrance of the Rood Screen & a further station for the final words at the step of the Altar. If the Bidding Prayer is given, it shall be done at the Rood Screen, Psalms 67 Deus Misereatur & 130 De profundis may follow it, except in Trentals and the three days before Easter. It may be cut at the end of the Litany of the saints. 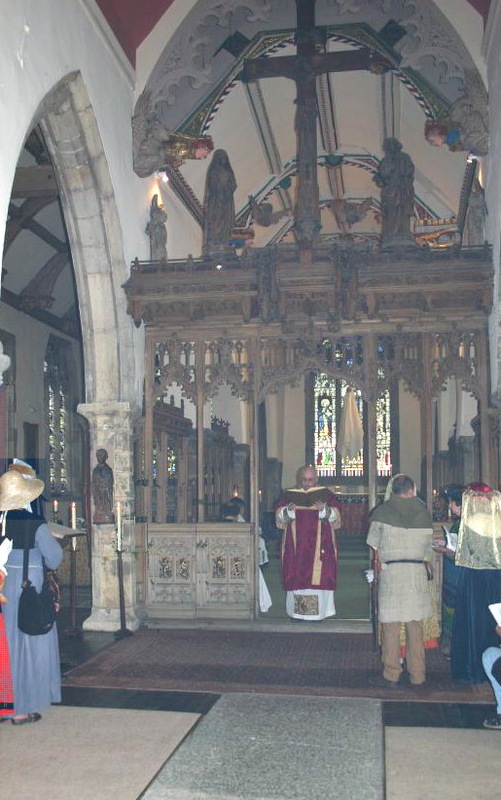 When they have reached the Altar, The Priest shall kiss the Altar and bless the Sub Deacon with the Crucifer and Taperers who shall go to the Vestry Chapel and process in with the Gospel book, taking it to the Quire Lectern, during which the Choir shall sing the Hymn following and the Priest shall proceed with censing the Altar. Holy, Holy, Holy! Merciful Almighty! God in Three Persons, Holy Trinity! Which wert and art, Who ever more shall be. Take away from us we beseech Thee O Lord, all our sins, that we may be deemed worthy to enter the Holy of Holies with pure minds. Through Jesus Christ Thine only Son our Lord. Amen. Priest: The Lord in Whose honour this incense is burnt, by Him be it blessed. In the Name of the Father, and of the Son, + and of the Holy Ghost. 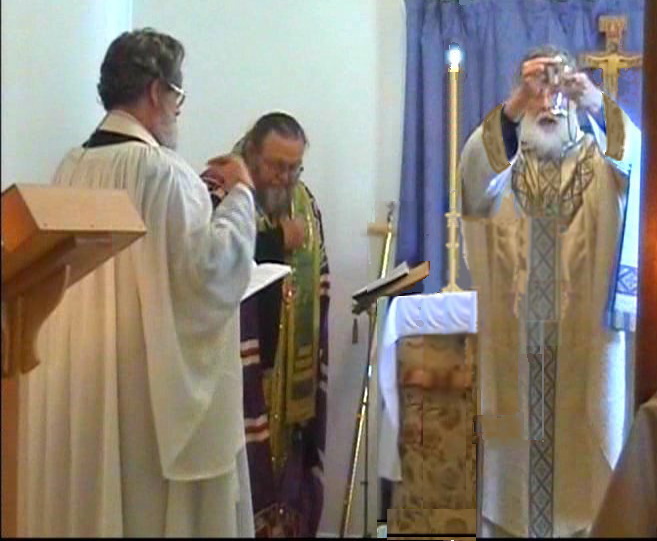 The Deacon bringing the thurible, the Priest shall CENSE THE ALTAR, first on the right side, then in the midst and then on the left side. The Office of the Day is repeated. The Priest and Ministers, having said the Office and the Kyrie, go to the sedilia and wait whilst the the Choir sings them. Then follows the Gloria in Excelsis, the Priest beginning it in the midst of the Altar, and then saying the rest privately with his Ministers on the right side. All: And in earth peace, good will towards men. We praise Thee, we bless Thee, we bow worship Thee, arise we glorify Thee, we give thanks to Thee for Thy great glory, O Lord God, Heavenly King, God the Father Almighty. O Lord, the only-begotten Son Jesu Christ; O Lord God, Lamb of God, Son of the Father, that takest away the sins of the world, have mercy upon us. Thou that takest away the sins of the world, have mercy upon us. Thou that takest away the sins of the world, bow receive our prayer. arise Thou that sittest at the right hand of God the Father, have mercy upon us. For Thou only art Holy; Thou only art the Lord; Thou only O Christ, with the Holy Ghost art most high in the glory + bow of God the Father. arise Amen. Then shall he say the Collects for the day which shall always be uneven in number. If there be any memorial, then, “Let us pray” is said as before, only all the remaining Collects are said after it. The normal position of the Ministers is one behind the other each on their step; when the Priest turns then the Deacon does the same, but the Sub-Deacon bows and adjusts the Priest’s chasuble. If a Bishop celebrates, all the Deacons and Sub-Deacons observe the same rule, with the principal Deacon and Sub-Deacon standing in the midst; nevertheless, the principal Sub-Deacon always adjusts the Celebrant’s chasuble. 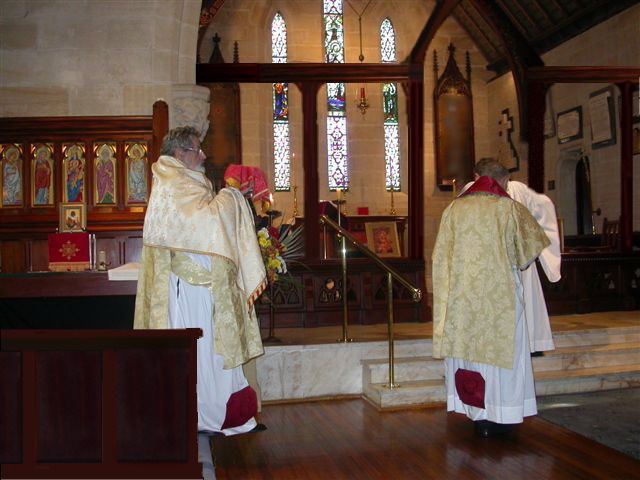 All clergy are bound to stand at the Liturgy except while the Epistle, Gradual, Alleluia or Tract is chanted. 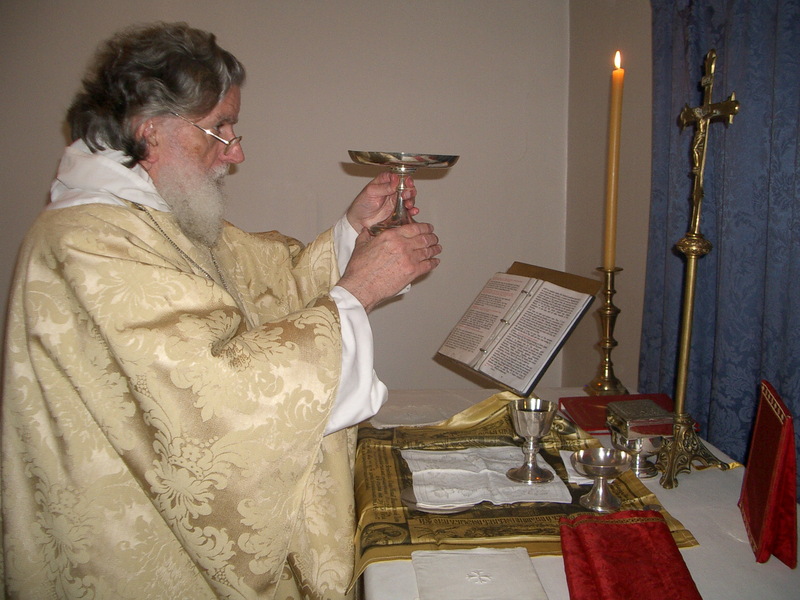 On Double feasts, all must stand at the Alleluia and also at the Gradual, Alleluia etc. There may be up to seven Collects, but always be an uneven number. and on others from the Quire step at the entrance of the Screen. Priest: The Lord be in thy heart and thy mouth, that thou mayest proclaim the Holy Gospel of God. In the Name of the Father and of the Son, and of the Holy Ghost. Amen. 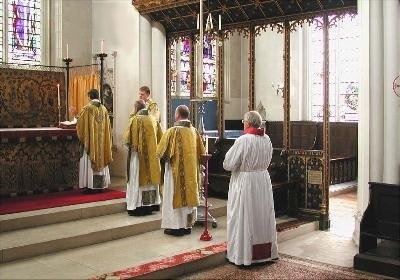 The Deacon then processes through the midst of the Quire, carrying the Text solemnly in his left hand, the Thurifer, Taperers and Sub-Deacon precede him, if it be a double feast: led by a Crucifer. At the Quire Lectern, the Sub-Deacon opposite him, the Taperers on either side of the Lectern, the Crucifer behind the Sub-Deacon, the Thurifer behind the Deacon. The Lectern and the Deacon are inclined towards the North. The Deacon begins, signing himself on forehead, mouth & chest, then the Book, with his thumb . The people and choir turn to the Altar bow, then turn to face the Gospel Book. Deacon: The sequence of the Holy Gospel is written in the___Chapter of _the Gospel according to Saint ___, beginning at the ___Verse. 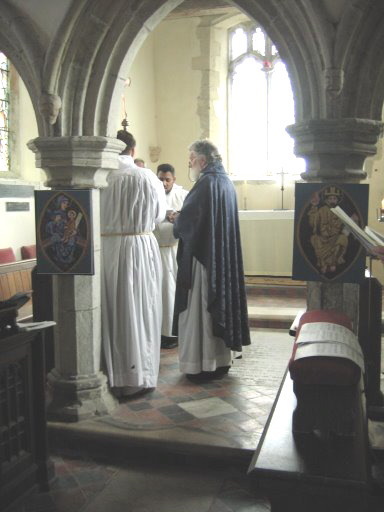 The Ministers being returned from the Pulpitum to the Altar, let the Deacon give the Priest the Book to kiss, standing at his right hand, the Sub-Deacon ministering to the Deacon and the Acolyte to the Sub-Deacon. The Priest, standing in the midst of the Altar, begins the Creed. The people and ministers face the Altar bow, and join in the Creed. During the Creed, the Corporal is unfolded in the midst of the Altar. Choir/All: the Father Almighty, maker of Heaven and earth, and of all things visible and invisible. And in one Lord (bow) Jesus Christ, (arise) the only-begotten Son of God. Begotten of His Father before all worlds. God of God, Light of Light, very God of very God. Begotten, not made, being of one substance with the Father: By Whom all things were made. Who for us men, and for our salvation came down from Heaven, (bow) and was incarnate by the Holy Ghost of the Virgin Mary, and was made Man, and was Crucified also for us: Under Pontius Pilate, He suffered and was buried. (arise) And the third day He rose again, according to the Scriptures. and Ascended into Heaven: And sitteth on the right hand of the Father. And He shall come again with glory to judge both the quick and the dead: Whose Kingdom shall have no end. And I believe in the Holy Ghost, the Lord, the giver of life. Who proceedeth from the Father. Who with the Father and (bow) the Son (arise) together is worshipped and glorified, Who spake by the Prophets. And I believe One, Holy, Catholic and Apostolic Church. I acknowledge one Baptism for the remission of sins. And I look for the resurrection of the dead, and the life + of the world to come. Amen. to the Credence. During which, the Choir sings the Offertory and the Cherubic Hymn is sung. Our full homage to command. As the darkness clears away. His own self for Heavenly food. Alleluia, Lord most High. Priest: Receive O Holy Trinity, this oblation which I, an unworthy sinner, offer in Thine honour, Blessed Mary’s, and all Thy Saints, for my sins and offences; for the salvation of the living and the repose of all the faithful departed. In the Name of the Father, + and of the Son, and of the Holy Ghost, let this Sacrifice be acceptable to Almighty God. Priest: Let my prayer, O Lord, be set forth in Thy sight as the incense. After this, the Priest is censed by the Deacon and the Sub-Deacon brings him the Text to kiss. 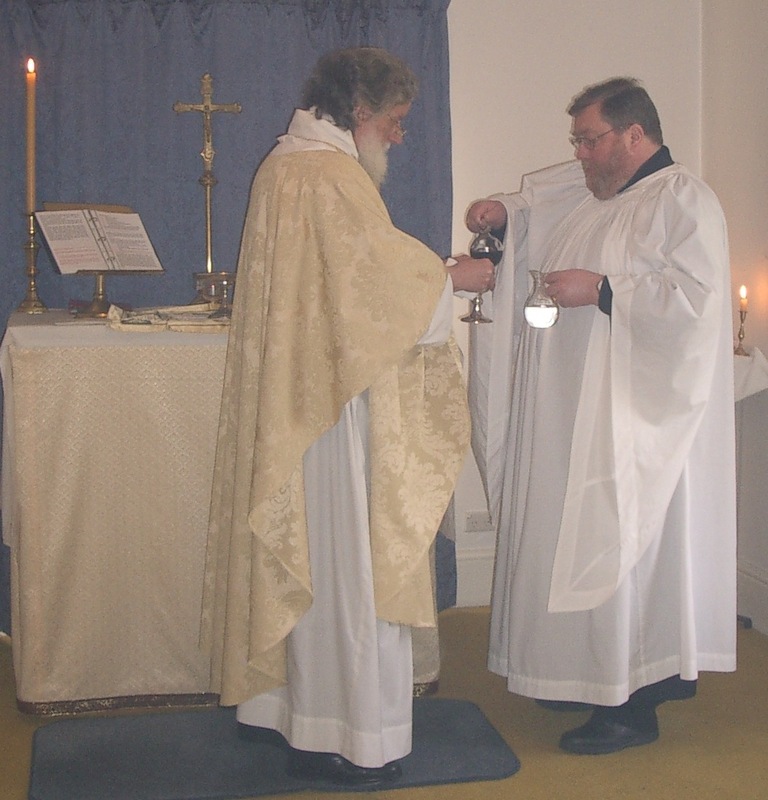 Then the Thurifer censes the Choir, beginning with the Rulers, the upper grade of the Dean’s side, beginning with the Dean; then the upper grade of the Precentor’s side; in like manner the second and first grades, bowing to each of the Clergy as he censes them, the Sub-Deacon following with the Text for each to kiss. Priest: Cleanse me, O Lord, from all pollution of mind and body, that I may in purity perform the holy work of the Lord. Priest: In the spirit of humility and with contrite heart let us be accepted of Thee, O Lord and let our Sacrifice be in such wise in Thy sight that it may be accepted of Thee this day, and please Thee O Lord our God. Priest: In the Name of the Father, and of the Son, + and of the Holy Ghost. Amen. Priest: Pray, brethren, for me that this my Sacrifice, which is also equally yours, may be accepted by our Lord God. People: The grace of the Holy Spirit enlighten thy heart and lips, and the Lord graciously accept this sacrifice of praise, at thy hands, for our sins and our offences. Choir: Do Thou receive them for the souls whose memory we keep this day; make them, O Lord, pass from death unto life. Priest: In the spirit of humility, Brethren and sisters, pray or the faithful departed. Deacon: Grant them eternal rest O Lord, and let Thy light perpetual shine upon them, which of old time Thou didst promise to Abraham and his seed. Then turning to the Altar, let the Priest say the Secrets in number according to the Collects, ending them with: world without end. Amen. 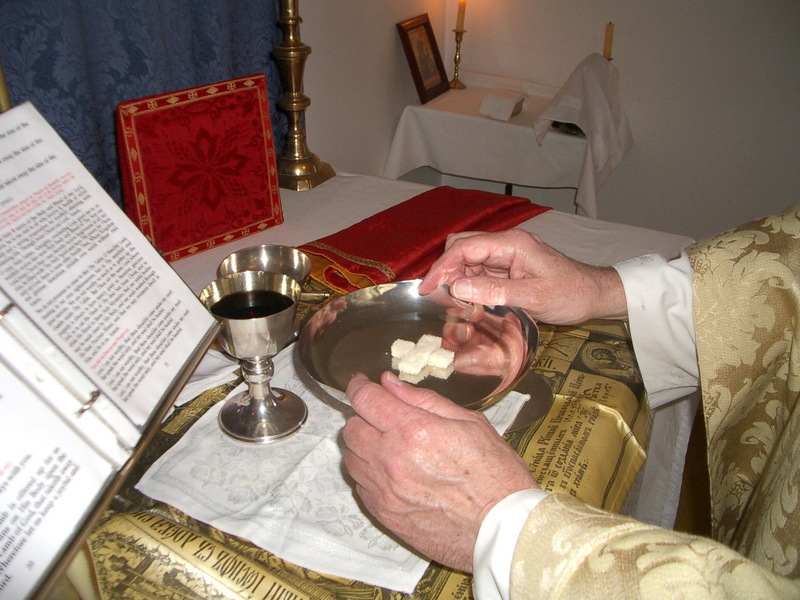 Every Priest has a duty to give Communion only to those whom he knows to be Baptised, Chrismated, Orthodox Christians. No person who has not been Baptised and Chrismated in the Orthodox Church of God may receive the Holy Communion of the Body and Blood of our Lord and Saviour Jesus Christ. 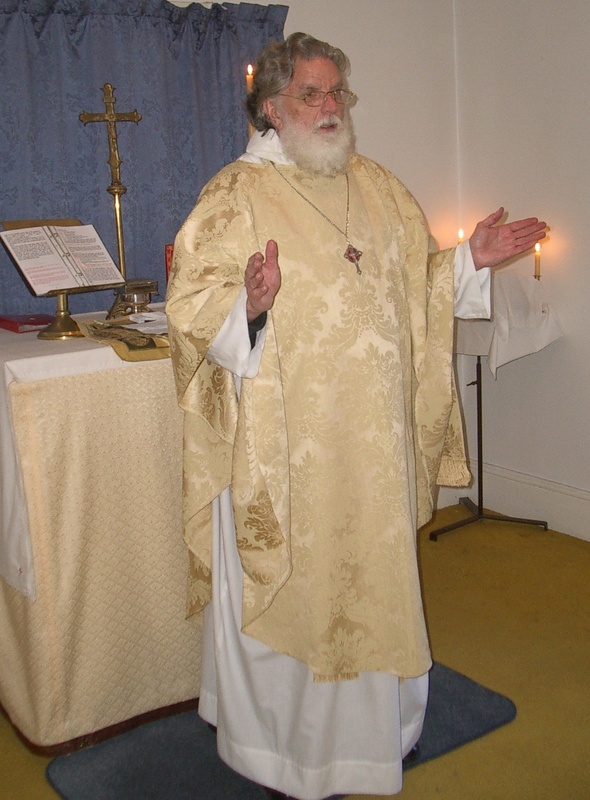 An Orthodox person who has not confessed his offences to a Priest, and received Absolution, should not receive the Holy Communion of the Body and Blood of our Lord and Saviour Jesus Christ. The following part of the Divine Liturgy after the Sursum Corda, is the Canon. This is the most solemn part of the Liturgy, including the Institution, Anamnesis, Epiclesis, Consecration, Fraction and Fusion. 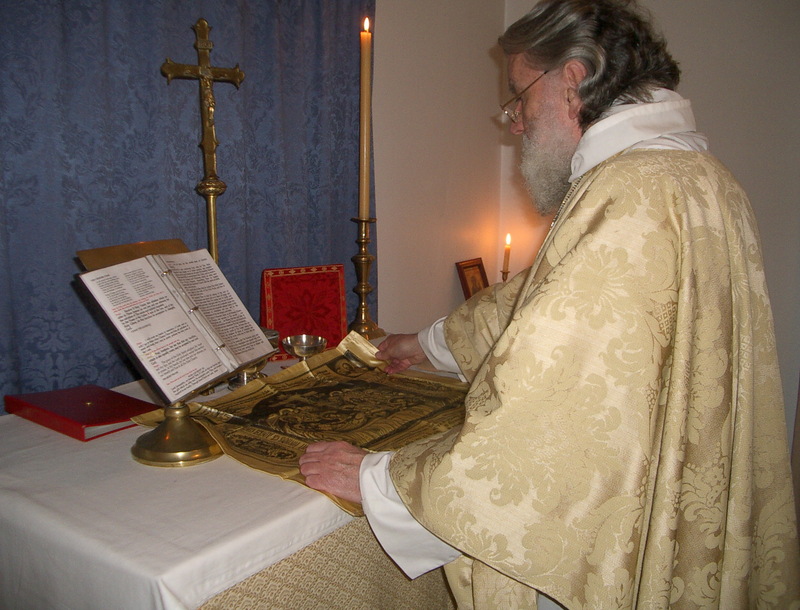 In ancient times it was called “the most dangerous prayer” for the reason that during it, the Priest and people must not allow themselves to be distracted..
Let the Deacon give the the small Paten, under the Offertory Veil, to the Sub-Deacon and him to the Acolyte to hold until the end of Our Father. (except at Requiems) standing behind the Sub-Deacon. The people kneel until the Peace except from Easter to Trinity I.
Choir: Holy, Holy, holy, Lord God of hosts, Heaven and earth are full of _Thy glory: Glory be to Thee, O Lord most High. The Priest raises his arms, joins his hands and he alone intones. Priest: Blessed + is He that cometh in the Name of the Lord. Glory be to _Thee O Lord. Choir: Hosanna in the highest. these gifts + these offerings + these holy + undefiled Sacrifices which we offer unto Thee firstly on behalf of Thy Holy Catholic Church, to which do Thou deign to grant peace, guard, unite and govern throughout the world, together with Thy servants our Metropolitan our Bishop, Elizabeth our Queen, and all the Orthodox who maintain the Catholic and Apostolic Faith. In praying for whom a due order of charity ought to be observed. Let the Priest pray five times: First for himself, secondly for his father and mother, carnal and spiritual, and other kin; thirdly for special friends, his Parishioners and others, fourthly for all present; fifthly for all Christian people; and here the Priest may commend all his friends to God: With the caution however, that there should be not an unseemly pause both for fear of distraction of mind and of suggestions which may be made by evil angels as well as other dangers. and this congregation here present, whose faith and devotion is known to Thee; on whose behalf we offer this Sacrifice of Praise and for ourselves, our souls and bodies, for our redemption, salvation and preservation, we, who are faithful unto Thee, the Eternal, Living and True God. Wherefore in communion with and reverencing the memory of the glorious ever-Virgin Mary Mother of our God and Lord, Jesus Chris Thy blessed Apostles and Martyrs, Peter and Paul, Andrew, James, John, Thomas, James, Philip, Bartholomew, Matthew, Simon and Thaddaeus Cyprian, Basil, Laurence, Chrysogonus, John and Paul, Cosmas and Damian and all Thy Saints for whose sake and prayers grant, we beseech Thee that we be strengthened and protected, through Christ our Lord. And here we most humbly beseech Thee O Lord, graciously to accept this oblation of our service and that of Thy whole family; to dispose our days in Thy peace, delivering us from eternal damnation and causing us to be numbered with the flock of Thine elect. Which oblation do Thou O God Almighty, vouschafe to make altogether Blessed + meet + and right + reasonable and acceptable, that it may become the Body + and Blood + of Thy most dearly Beloved Son, Jesus Christ. Incline until the end of the Consecration, place his hand on all of the bread but not to break it. to Thee, blessed, brake, and gave It to His Disciples saying, TAKE, AND EAT YE ALL OF THIS, FOR THIS IS MY BODY. Lift the Paten to eye level, then reverently replace It before the Chalice, making the sign of the Cross. TAKE AND DRINK YE ALL OF THIS FOR THIS IS THE CUP OF MY BLOOD OF THE NEW AND EVERLASTING TESTAMENT, THE MYSTERY OF FAITH WHICH SHALL BE SHED FOR YOU AND FOR MANY FOR THE REMISSION OF SINS. AS OFT AS YE SHALL DO THIS, YE DO IT IN REMEMBRANCE OF ME. a pure offering, + an Holy + offering, an undefiled + Sacrifice, the Holy + Bread of eternal life, the Cup + of everlasting Salvation. And here we, Thy servants, offer the gifts that Thou hast commanded for our salvation, that Thou mayest be pleased to send down Thy Holy Spirit upon this Sacrifice that It may be duly and properly changed in the Name of the Father and of the Son and of the Holy Ghost, in the transformation of the Body + and Blood + of our Lord, Jesus Christ and that It may be for us who partake thereof, Life eternal and the everlasting Kingdom. Miss. Goth. Thr. Peter. And we entirely desire Thy Fatherly goodness to look upon and accept them as Thou didst accept the gifts of Thy servant Abel, the sacrifices of our father Abraham and Thy high priest Melchisedeck, most humbly beseeching Thee Almighty God, to command Thy Angel to carry them before the high Altar of Thy Divine Majesty, and that all we, who are partakers of this Altar Here he shall kiss the Altar to the right of the Sacrifice receive the most sacred Body + and Blood + of Thy Son, and may be fulfilled with Thy grace and Heavenly benediction + And here he shall sign himself upon the face through the same Christ our Lord. Amen. Here he uncovers the Chalice and signs on all sides, first beyond, secondly in line with it, thirdly below it, fourthly beyond on either side, fifthly in front. 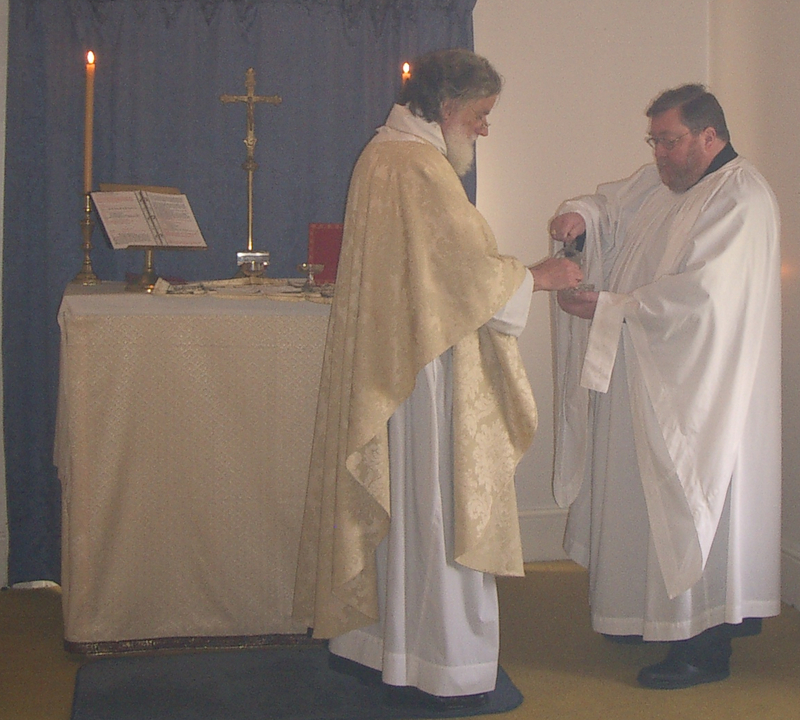 Here the Deacon gives the small Paten to the Priest who shall kiss it, place it before his left and right eyes, Cross himself with it and return it to the Deacon, who shall then slide the small Paten under the corporas. Andrew and all the Saints + graciously granting us peace now, that with the help of Thy loving kindness we may ever be free from sin and disquietude. V: And lead us not into temptation. R: Let them also that hate Him, flee before Him. V: Not unto us, O Lord, not unto us. R: But unto Thy Name give the glory. V: Let us pray for the afflicted and for captives. R: Deliver Israel, O God, out of all his troubles. V: Send them help O Lord, from Thy Sanctuary. R: And strengthen them out of Sion. V: Be unto us O Lord a strong tower. R: From the face of the enemy. V: O Lord, save the Queen. R: And mercifully hear us when we call upon Thee. V: O Lord, hear our prayer. R: And let our cry come unto Thee. Priest:_O God, Who in Thy wondrous Providence orderest all things: Govern, we beseech Thee, O Lord, Thy servant, our Bishop and at the intercession of the Blessed Virgin Mary, Mother of God, and of all Thy Saints, multiply upon him the gifts of Thy grace, that he, being delivered from all offences, and not being left destitute of temporal help, may rejoice in Thy never failing ordinances. Through Jesus Christ, Who liveth and reigneth with Thee and the Holy Ghost, One God, world without end. Grant, we beseech Thee Almighty God, to Thy servant Elizabeth our Queen, health of mind and body that she, cleaving to a good work, may ever be protected by Thy mighty protection. Through Jesus Christ Who liveth and reigneth with Thee and the Holy Ghost, One God, world without end. Deacon: Let us bow down for the Blessing. Priest: Behold the Lord, + behold Him Who taketh away the sins of the world. People: Thanks be to Thee O Lord. People: Grant us Thy peace. Priest: Let this most Holy + union of the Body and Blood of our Lord, Jesus Christ, be to me and to all who receive It, health of mind and body and a saving preparation for worthily attaining unto everlasting life. Through Jesus Christ our Lord. Amen. O Lord, Holy Father, Almighty, everlasting God, grant me to so worthily receive this most Holy Body and Blood of Thy Son our Lord Jesus Christ that I may thereby receive forgiveness of all my sins, be filled with Thy Holy Spirit and have Thy peace; for Thou only art God, there is none other beside Thee, Whose Kingdom and glorious dominion abideth ever world without end. Amen. Priest: Peace be with thee and the Church of God. O God the Father, fount and source of all goodness, Who, moved by Thy loving kindness didst will Thine only-begotten Son to descend for us to this lower world and to become incarnate, which I unworthy hold. bow I worship Thee, I glorify Thee, I praise Thee with the whole purpose of my heart and mind, beseeching Thee never to forsake Thy servants but forgive their sins that they may serve Thee, the only True God, with pure heart and chaste body. Through the same Jesus Christ our Lord. arise Amen. O Lord Jesus Christ, Son of the Living God, Who by the will of the Father and the cooperation of the Holy Ghost, hast by Thy death, given life to the world; deliver me, I beseech Thee, by this Thy most Holy Body and Blood, from all my iniquities and from every evil; make me ever obedient to Thy commandments, and suffer me not to be separated from Thee, O Saviour of the world. Who with the Father and the same Holy Ghost, liveth and reigneth ever One God, world without end. Amen. Let not the Sacrament of Thy Body and Blood O Lord Jesus Christ, which I, although unworthy, do receive, be for me judgement and condemnation, but by Thy good-ness, profitable to the health of my body and soul. Amen. Hail evermore most Holy Body of Christ, to me before and above all, the highest source of joy. The Body of our Lord Jesus Christ be unto me a sinner, the Way and the Life, in the Name + of the Father and of the Son and of the Holy Ghost. Amen. Hail evermore Heavenly Blood, to me before all and above all the highest source of joy. The Body and Blood of our Lord Jesus Christ be unto me perpetual healing unto everlasting life. In the Name + of the Father and of the son, and of the Holy Ghost. Amen. I give thanks unto Thee, O Lord, Holy Father, Almighty everlasting God, Who hast refreshed me with the most sacred Body and Blood of Thy dear Son, our Lord Jesus Christ. I pray that this Sacrament of our salvation of which I, an unworthy sinner have partaken, turn not to judgement nor condemnation as is justly due, but to be profitable to the preservation of my body and soul unto life everlasting. Amen. The Body of our Lord Jesus Christ which was given for thee, preserve thy body and soul unto everlasting life. What we have taken with our mouth, O Lord, may we receive with a pure heart and by a temporal gift, may our everlasting healing be effected. The Deacon and Sub-Deacon pour wine and water into the Chalice, rinsing the Priest’s fingers, lest any relics of the Body and Blood remain thereon or in the Chalice. Let this Communion O Lord, cleanse us from sin and make us partakers of a Heavenly healing. Let us adore the sign of the Cross whereby we have received the Sacrament of salvation. The Priest turns back to face the Altar. Deacon: Let us give thanks unto the Lord. Let this obedient performance of my bounden duty be pleasing unto Thee, O Holy Trinity and grant that this Sacrifice which I unworthy that I am, have offered in the sight of Thy Majesty, may be acceptable unto Thee; and may, through Thy mercy, obtain Thy favour for myself and all on whose behalf I have offered it. Who livest and reignest, God, world without end. Amen. IN THE BEGINNING was the Word, and the Word was with God, and the Word was God. The same was in the beginning with God. All things were made by Him; and without Him was not anything made that was made. In Him was life; and the life was the Light of men. And the Light shineth in darkness; and the darkness comprehended it not. There was a man sent from God, whose name was John. The same came for a witness, to bear witness of the Light, that all men through Him might believe. He was not that Light, but was sent to bear witness of that Light. That was the true Light, which lighteth every man that cometh into the world. He was in the world, and the world was made by Him, and the world knew Him not. He came unto His own, and His own received him not. But as many as received Him, to them gave He power to become the sons of God, even to them that believe on His Name, which were born, not of blood, nor of the will of the flesh, nor of the will of man, but of God. bow And the Word was made flesh, and dwelt among us, arise (and we beheld His glory, the glory as of the Only-Begotten of the Father,) full of grace and truth. People: Henceforth, world without end. Priest: Let us bless the Lord. Bless, + O Lord, this creature of bread, as Thou didst bless the five loaves in the wilderness; that all who taste thereof may receive health both in body and soul. In the Name + of the Father, and + of the Son, and of the Holy + Ghost. Amen. Then shall he sprinkle the bread with the holy water. The bread shall be distributed to all by the Priest and ministers. All those present who profess themselves to be Christians, whether Orthodox or not, may come forward and receive the Eulogion Bread. Antiphon: Let us sing the song of the Three Children. O ye Priests of the Lord, bless ye the Lord: Praise Him and magnify Him forever. O ye servants of the Lord, bless ye the Lord: Praise Him and magnify Him forever. O ye Spirits and souls of the Righteous, bless ye the Lord: Praise Him and magnify Him forever. O ye holy and humble men of heart, bless ye the Lord: Praise Him and magnify Him forever. O Ananias, Azarias and Misael, bless ye the Lord: Praise Him and magnify Him forever. Praise Him in the sound of the trumpet: Praise Him upon the lute and the harp. Praise Him in the cymbals and dances: Praise Him upon the loud cymbals. Antiphon: Let us sing the Song of the Three Children, which they sang in the furnace of fire and give thanks unto the Lord. V: Let us bless the Father, the Son and the Holy Ghost. R: Let us praise Him and magnify Him forever. V: Blessed art Thou O Lord, in the firmament of Heaven, to be praised and glorified above all forever. R: The Holy Trinity bless and keep us. Amen. V: Enter not into judgement with Thy servant O Lord. R: For in Thy sight shall no man living be justified. V: Turn us, O Lord God of Hosts. O God, Who didst for the Three Children quench the flames of fire, mercifully grant that we, Thy servants may not be consumed by the flame of our sins. Through Jesus Christ our Lord. Amen. Kindle in our reigns and our heart O Lord, the fire of the Holy Ghost, that we may serve Thee with a chaste body, and please Thee with a pure heart. Through Jesus Christ our Lord. Amen. Prevent us, O Lord, with Thy most gracious favour and further us with Thy cont-inual help, that in all our doings begun, continued and ended in Thee, we may do always that is righteous in Thy sight. Through Jesus Christ our Lord. Amen.